I remembered the feeling of inspiration the day I stumbled upon Aida Azlin. To you who don't know her, Aida is a writer (website), vlogger (youtube), and entrepreneur. Following her had made a huge change in the way I view life, spiritually. I became more confident of myself, discovering and loving myself more, learning to be a better Muslim and striving for living positively. Anyway, I'm not going to talk about her, I might do that some other time, but I wanted to share with you about one of her latest vlogs. She shared her father's concern that one day, she could be run out of ideas since she's doing a work that requires ideas and creativity to keep going. Then she clarifies that she didn't worry about it at all and the key to having more and more ideas is to be consistent in what she does. She disciplined herself to make sure she posted her love letters every Tuesday and three vlogs per week without fail as she promised her subscribers. By being consistent, the ideas just kept coming to her. I thought hard about what Aida said after watching her vlog and I realized I failed at most things in my life because I wasn't consistent. During my study days, I wasn't consistent at being hardworking and passion enough. I spent most of my free time by doing non-studying related things, I didn't do my homework and didn't study early for exams. My close friend was just like me and we didn't score to be one of the top students in our degree days. But surprisingly she's doing better and greater during her masters study. When I asked how did she manage to be better at studying though doing masters obviously is harder than a degree, she said, it's as simple as being consistent and she regretted that she wasn't consistent during our degree days. She screamed, "I think I could even beat Muni if I was this consistent and hardworking enough!" - Muni was one of the top students during our degree days. I'm actually wasn't consistent enough till today. I often procrastinate my works and delayed my part-time work submission though I knew earlier that it needed to be done weekly or daily. I realized it somehow could tarnish my image and made me looked unprofessional. The same goes for blogging. I might not want to feel the burden to keep updating the blog though I don't feel like it to or having writer's block but it made it doesn't feel sincere to say that I love writing or writing is my passion because I wasn't consistent at keeping the blog alive. Also as a Muslim, we need to be consistent at doing our Ibadah. We should discipline ourselves at performing Solah at the beginning of prayer time instead of delaying and procrastinating even when we had nothing to do. Set our priority right and the most important thing to do daily, of course, is our prayer. How can our prayer be heard when we didn't make it our top priority, right? Aida did have her lazy days where she felt like not wanting to update but she pushed herself to do it, to be consistent, so why can't I push myself, right? I already knew that consistency is the key to success, that I can achieve so much by being consistent but why, why didn't I practice it? sobsob. I've mentioned in my previous post that I wanted to be more consistent in writing, reading and drawing this year so hopefully, I'll do just that and of course, being consistent at my works too. You can do it, Lya! (*pat myself on the back). 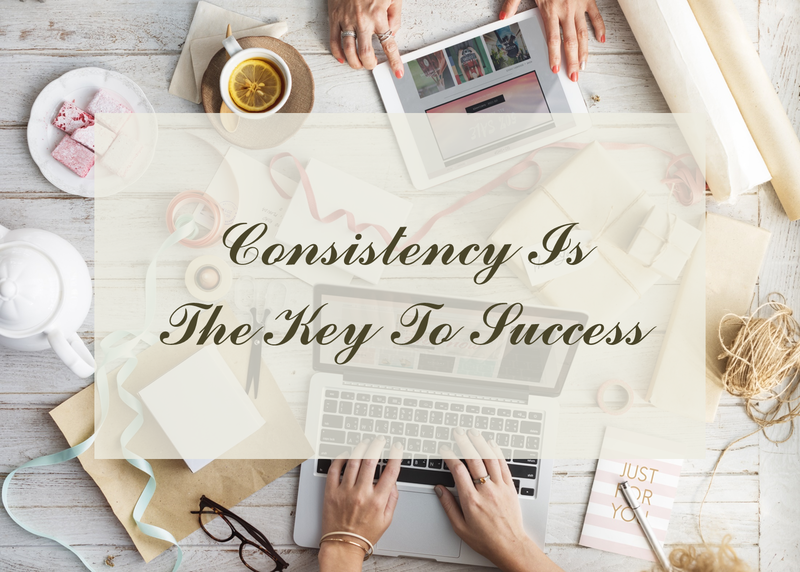 Share with me about what makes you good at being consistent? I need tips! i watch Aida's vids jugak sometimes n yes.. her words make us think deep. i consistent upon what i wish for by putting myself first and ignore others. its not easy bcoz i think i have hati yang lembik. but as i grow older.. da pandai sikit tepis tepis yang tak perlu. its my dream jadi i have to be at the top priority. Yeap, I agree that we should put ourselves first before we think about others. In the end, it's our own happiness that really matters! And consistency is hard. It is much easier to start new things but to be discipline enough to follow the routines every day is a battle. Yeap, consistency is so so hard. Let's strive to be consistent! Betul, being consistent is the key to success. Semoga kita pun boleh belajar utk jadi lebih konsisten dalam pekerjaan seharian kita! Mrs. A pun rasa consistency is hard. Anyway syukur alhamdulilah yang wajib itu masih mampu consistent. Haha betul tu! Lya sendiri sometimes ter-miss jugak consistency untuk update blog tu!